It was an awesome site - about 5,000 dishes and hundreds of participants gathered in Araneta Coliseum yesterday to set a new Guinness World Record, beating India's 4,668 count in 2007. Details of the event are below. You only need to put food and pride together to see how cheesy Pinoys can get. Through a project which aims to make a delicious and inspiring Christmas after the devastation brought by Ondoy and Pepeng, Eden Cheese is spearheading the “YUMM - Your Ulam Mas Masarap” campaign, which plans to unite everyone in helping save Christmas for families who are still reeling from the challenges brought by these recent disasters. 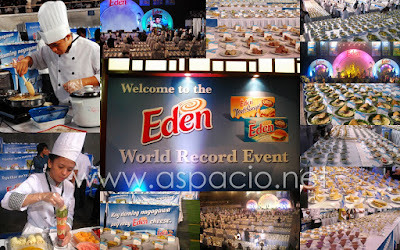 In the said campaign, the brand is summoning the innate kitchen creativity of Pinoys to help make 5,000 cheese-inspired dishes to beat the previous Guinness World Record™ of "The Most Number Of Dishes On Display, In A Single Day” of 4,668 set by India in 2007 in one big event. Eden has taken this further with a twist of ingenuity by fusing cheese into each dish. Premier culinary school Magsaysay Institute of Hospitality and Culinary Arts (MIHCA) contributed most of the research and student manpower in the making of the event, with the added help of other schools such as Regina Carmeli, St. Paul College, Centro Escolar University, Emilio Aguinaldo College, La Consolacion College, and Arellano University.. Meanwhile, at Eden’s website, www.sarapngbuhay.com, people are encouraged to sign up and share their cheese recipes. And to further strengthen its cause, Eden is organizing the very first Keso de Gallo where Filipinos will use Eden cheese to creatively interpret the breadth of the country’s cuisine while providing a feast that will bring joy and delight to as many families as possible. In cooperation with ABS-CBN Foundation, people’s organizations, Local Government Units, and Filipinos all over the country, Eden will relive the Filipino tradition of Misa de Galo and bring more goodness to this post-Simbang Gabi feast. Nine mornings with nine featured dishes in town plazas of Bacolod City, Iloilo, Davao, Cagayan de Oro, Cebu City, Naga, Butuan City, Laoag and Pampanga will be highlighted, as Eden enhances the local traditional delicacies enjoyed during the holidays with the goodness of Eden cheese. Known for its quality and wholesome taste, Eden has been a staple of every discerning foodie’s kitchen. From simple snacks to sophisticated main courses, Eden cheese products can be relied upon to deliver great tasting meals. A versatile ingredient which easily fits in a variety of local dishes, the use of Eden cheese products is as limitless as the imagination of its user. And in the hands of some pretty creative people from various culinary backgrounds, December 14, 2009 is going to be one red-letter day as all these people work with each other in landing the Philippines in the record books with the most number of cheese dishes. Indeed, for a country that boasts of various culinary traditions from its 7,107 islands, there are a lot of things than can be done to inspire and cheesify the Filipino everyday. Kraft Foods (http://www.kraftfoodscompany.com) makes today delicious in 150 countries around the globe. Our 100,000 Kraft Foodies work tirelessly to make delicious foods consumers can feel good about. From American brand icons like Kraft cheeses, dinners and dressings, Maxwell House coffees and Oscar Mayer meats, to global powerhouse brands like Oreo and LU biscuits, Philadelphia cream cheeses, Jacobs and Carte Noire coffees, Tang powdered beverages and Milka, Cote d'Or, Lacta and Toblerone chocolates, our brands deliver millions of smiles every day. Kraft Foods Inc. (NYSE: KFT) is the world’s second largest food company with annual revenues of $42 billion. The company is a member of the Dow Jones Industrial Average, Standard & Poor's 500, the Dow Jones Sustainability Index and Ethibel Sustainability Index.